The following article is based on remarks made to the regular meeting of SCGA on June 7, 1973 by Midge Hill. We all know that the best advice one can receive (and follow) on how to breed show guppies is, “.. get a good quality, well established strain and then keep it as pure as you can.” Keeping a strain pure is called inbreeding the strain. Inbreeding means the breeding of fish that are closely related to each other genetically, such as brother to sister, father to daughter, etc. A technique known as line crossing is used by some breeders to maintain an established strain, and it also comes under the general heading which we refer to loosely as inbreeding. Outcrossing is the opposite of inbreeding since outcrossing means the mating of fish that are genetically unrelated to each other. Now the reason that all successful guppy breeders outcross strains from time to time but seldom advise others to try it, is because outcrossing is really a form of genetic Russian roulette. A successful outcross requires that the strains which are crossed my be genetically compatible. The odds against finding two compatible strains are very high. Even when a good result is obtained from an outcross it is as often due to blind luck as to intelligent selection. There are times, however, when outcrossing may produce something that no amount of inbreeding within a stain will accomplish. Them are also times when your only alternative is to outcross, for example, when you buy a fish at a show auction without a related mate. Fortunately, there are ways to improve your chances of getting a good result from an outcross. And this is what I want to talk to you about tonight. That is, when to outcross, how to pick the outcross strain, and how to proceed after the initial outcross to get the best result in subsequent generations. Before I get into the good reasons for outcrossing, I want to point out that there are a lot of no-good reasons for outcrossing. Now there is nothing wrong with outcrossing just for the sake of idle curiosity or for some other frivolous reason, as long as you do not pass these fish along. What outcrossing does is to rearrange, to scramble together, the genetic patterns of the two parents. Therefore, offspring from an outcross are genetically all mixed up. They are referred to as hybrids. Play with these hybrids if you want to, but do not pass them along; for they are genetic accidents and are not going to do much good for the hobby. I) When an established strain will not produce characteristics you want (a larger dorsal, perhaps) because the gene pattern for that characteristic is simply not present in the strain. 2) When you are having trouble with an established strain, infertility, maybe. 3) To outcross for big show hybrids. 4) Necessity, as in the case of a male purchased at a show auction without a related female. 5) To create your own strain. I want to discuss each of these five situations in detail, to tell you why I think outcrossing, as chancy as it is, can be a good thing to do; and how to proceed after the initial outcross, because the breeding techniques are a little different for each type of outcross. In the first situation, where you have a good established strain but you have not gotten a certain feature you want by inbreeding or linecrossing within the strain, outcrossing can be the solution. Lets say that you have been working with a strain of reds which are not as bright a red as you would like. Dr. Larr has told us there are about four or five different genes for red. If your strain does not have all of these genes, no amount of inbreeding is going to produce what is not there to begin with. So, you can outcross to try to pick up the missing genes that are needed for a clearer, brighter color. 0r, perhaps, you have been trying to get a larger dorsal. You might be able through inbreeding by careful selection of parents, to get gradually over the years, a larger dorsal, maybe. But there is a chance to use an outcross to pick up a larger dorsal in less time. It goes without saying, doesn’t it, that you do not want to lose the fine characteristics of your original strain. So, while you are trying an outcross, you must keep your established strain going. Otherwise, it the outcross does not work, you will have lost your strain. Well, what strain do we pick to outcross into an established strain when we want to add a new feature to the established strain? The outcross strain should also be well established that means the strain has bred true over several generations, so that all of the males in each litter look very much alike and each generation looks very much like previous generations. The outcross strain should be of the same type as the strain you are going outcross it to. In other words, you should outcross red to red, blue to blue, halfblack red to halfblack red, etc. And, obviously, the outcross strain must have the particular characteristic you are looking for. When you find a strain that meets the above three requirements as much as possible, you make the outcross both ways. Take your best male and mate him to females of the outcross strain, and also take a male from the outcross strain and mate him to females from your original strain. You do this because you do not know which way will come out best. And, of course, you have to keep the young separate, so you can determine which way the outcross works best. Offspring from an outcross are referred to as the F1 generation, the second generation after the original outcross is called F2 generation, and so on. If you find a male in the F1 generation that looks like your original strain and also has the new feature from the outcross strain that you were trying for – well, you are just about as lucky as it is possible to be. What has happened is that the feature you wanted proved to be dominant. and so it appeared in the first generation. This happens sometime, and when it does you breed this F1 male to females from your original strain. (Remember, you have kept your original strain going,) This is the proper procedure, because you want to work back into your original strain as soon as possible after an outcross. Breeding the F1 male that looks most like your original strain and which also has the new characteristic you want to females from your original strain produces the F2 generation. You continue to do this, using only females from your original strain, because you must keep working the new characteristic back into that original strain. We have been talking about an outcross which produced the feature we wanted in the first generation. Many outcrosses will not be so lucky, the feature we want will not appear in the first generation, but that does not mean it isn’t there. There are two reasons why a feature possessed by a strain used in an outcross may not show up in the first generation: a) the feature is recessive, or, b) it is carried only by the females. If a special feature you want (and which was present in one of the strains used in the outcross) does not show up in the F generations, you must take brother and sister from an F1 litter and breed them together to find out if the trait is recessive. If it is recessive, it should show up in 25% of the offspring from this sibling breeding. Assuming that the feature is a recessive, and it shows up in the F2 generation (from breeding F1 brother to sister), you pick an F2 male that looks most like your original strain and which has the new feature and then breed him to females from your original, pure strain which you have kept pure for exactly this purpose. This gives you the F3 generation from the initial outcross. This F3 generation will now show the recessive trait. (From here on it is going to Sound complicated, but it really isn’t.) You must remember that what we mean when we say a trait is recessive is that an individual will not display a recessive trait unless he (or she) got the necessary genes from both parents. This F3 generation had and F2 male which did have the recessive trait for their father and their mother was from your original strain which does not carry the recessive; therefore, the F3’s got the recessive genes from only one parent. Each offspring in the F3 generation carries the recessive genes, but there will not be visible evidence of it. The next step is to breed brother to sister from the F3 to give offspring, 25% of which will again show the recessive trait. You can see that when you are breeding a recessive trait back into an established strain which does not carry the recessive, you have to use a two generation cycle for a while. In other words, every other generation you will breed siblings and in the alternate generations you will breed back to your pure strain females. You remember we said there might be another reason why a trait would not show up in the first generation. It might be that the new trait was passed to the F1 females, but not the F1 males. But you never know. Therefore, besides breeding brother to sister from the F1 generation to see if the missing trait is recessive, you must also breed some of the F1 females to males from your original strain to see if the trait you are working for is not recessive, but just carried by the females. If you get the new trait by breeding F females to your original strain males, you are off and running. That is, you would breed the males from your original strain into the hybrid females, which will be getting closer, genetically to your original strain after each generation of breeding. In summary, when an outcross is used to try to add a feature to an established strain, one of three things will happen in the fifth generation: 1) the desired trait is dominant; 2) it will not show in the first generation because it is recessive, or 3) it will not show in the first generation because it is carried by the females. The dominant trait and the trait carried by the females are the easiest to handle. The recessive trait is more difficult. But in all three your whole purpose is to breed the new trait into your original strain as often as possible. This breeding back to your original strain will mean that you are purifying the hybrids, but it also means that the hybrids will be getting more and more like your original strain. You may start losing the feature you made the initial outcross for and which you got in the first generations after the initial outcross. You have to watch out for that. If things start going the wrong way, then you begin mating brother to sister within the hybrids to see what happens. Now let us go on to the second situation in which I believe an outcross can be a good thing to do. This is the case of an established highly inbred strain which has developed a major genetic flaw such as infertility, a high percentage of crooked spines, susceptibility to disease, etc. An established strain which is rapidly going downhill because of a genetic problem (but which is still beautiful in other ways) can sometimes be rescued by careful selection of breeders without resorting to an outcross. You would want to try to do that first. Let me say here that inbreeding guppies, even very close inbreeding, is not of itself harmful. Guppies will take close inbreeding for many generations longer than most of us continue to work with any one strain Without significant loss or size or color or vigor. Dr. Eugene Larr and Dr. W. H. Hildeman, to mention only two genetic scientists who have exhaustively tested the effect of inbreeding on guppies, have both bred guppy strains brother to sister for over eighteen consecutive generations without loss of their desirable characteristics. When highly inbred strains develop serious genetic defects, and they often do. it is not because they have been inbred for a long time. 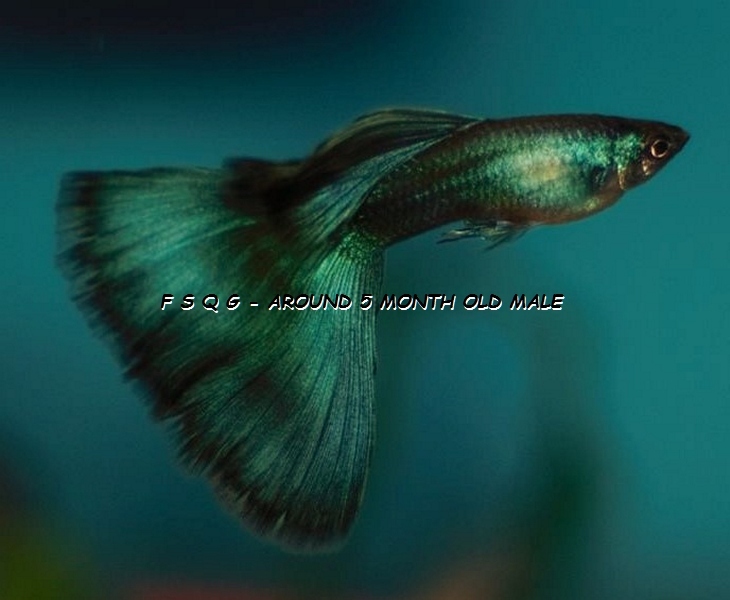 It is because the guppy breeder picked fish to use as parents that had some invisible weakness. Though these weaknesses do not show in the parents, they will show up in succeeding generations, usually in the form of deformities and/or lack of fertility. This sort of thing happens to the best of us. And it is a serious problem. After all, if the point is reached that a strain produces no young, the strain is lost. Or a well established strain will begin to throw a high percentage of deformed young in each litter, but the fish which survive undeformed are still beautiful. You would want to try to save these strains. But what if your established strain just gets worse, no matter how carefully you tried to pick the best parents; you can try an outcross. You still must keep the original strain going if you can, because you are going to bring back the outcross hybrids into the original strain as fast as you can. Again, when you pick the outcross strain, you will want one which looks as much as possible like your own strain, one which is also well established, and one which produces fertile and vigorous young. This is a big order, I know, but having acquired a strain to outcross to your own strain for the purpose of improving fertility and/or vigor, you will proceed as follows. Outcross both ways if at all possible. That is, take your best male and mate him to females of the outcross strain and also take a male from the outcross strain and mate him to females from your original strain. Again, you must keep the offspring from these matings separate. When these F1 hybrids are old enough to select breeders, you pick a male from the best looking of the F1 litters and breed him into females from your original (pure) strain. And you keep doing this in succeeding generations, working the hybrid males back to your pure strain females. If you have enough tank space, you can also try working back into your original strain in the other direction. By that I mean you can also try mating the hybrid femala~ from each generation after the outcross back to your pure strain males. My own experience is that you will get better results with the first method, that is, by breeding the hybrid males through your pure strain females. But if you have enough tank space, it wouldn’t hurt to try it both ways. Perhaps I have not said enough about why you want the outcross strain to be a well established, true breeding strain. Remember, that what an outcross does is scramble together the genetic patterns of the two strains which are crossed. If one side of the cross is itself only a few generations away from a previous outcross, all you have accomplished is to further mix up the genetic patterns. Long experience and experimentation have proved that these hybrid-hybrids may look good for a few generations, but that their mixed up gene patterns soon cause them to regress back to a small, motley fish like their wild ancestors. Some additional comments: This article is most valuable. The methods are still currently used by many successful breeders. I relied on these techniques when I first began developing my Half Black AOC lines. Whenever I introduce an unrelated line to one of my strains, I will adhere to these methods as closely as possible. Do not (after reading this article) try crossing into your set strains without having a purpose. Remember: every cross you make requires at least eight to ten additional tanks to raise the offspring in. Make certain to keep records of all breeders as well as the results in each generation. This entry was posted in Guppies - breeding and tagged Guppy Breeding, GUPPY GAZETTE, HOW TO OUTCROSS GUPPY STRAINS, Midge Hill. Bookmark the permalink.